You are here: Home / Customer Experience, Success, Loyalty, Retention / Renewing Customers or Retaining Them? Tactics or Strategy? There is a difference between renewing customers and retaining them. Just take a walk around an organization. Ask employees where they fit into the renewal versus retention equation. Depending on where people sit around the business table, they see the same things differently. When the workforce views renewing customers as a function of retaining customers, everyone begins to understand how “what they do” fits into “what everyone else does.” An interrelated puzzle is involved, not isolated tasks. Together, the puzzle pieces solve a complex equation. Retaining customers involves complex relationships, within your own organization (first) and then your customer’s house. When people feel interconnected, they perceive customer retention as a puzzle, in which they create critical-to-quality outcome pieces. By focusing on retaining customers, employees understand how meeting their numbers is interrelated. 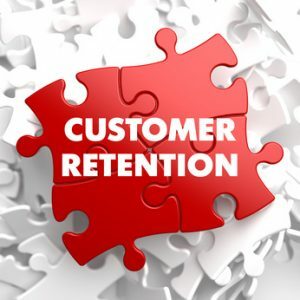 When I speak to sales audiences about customer retention, their expectations are that I will provide them with clever tools and tips on renewing customers, so they can meet quota. However, as they quickly discover, renewing customers is not an end in itself. Rather, renewal is part of corporate strategy. It involves building a collaboration culture which, by the way, includes them. Interestingly, their C-Suite is not looking for tools and tips to get customers to renew contracts for another year. Instead, the C-Suite searches for long-term strategies, incorporating company-wide resources, which impact both the top and bottom lines. Meeting their numbers looks a whole lot different than meeting sales quota. Which is why renewing customers is not an end in itself. Then again, when I speak to technical and operations professionals, their idea of customer retention is focused on strength of operator, equipment and software interface continuity and resilience. Otherwise, they are unable to meet their numbers, which revolve around efficiency, waste, safety, quality and capacity. Consequently, if there is no operational infrastructure, there is no renewal, let alone retention. Taken together, retaining customers combines people, processes, systems and equipment. Not just sales, not just operations or the supply chain. When there is a culture of collaboration and synergy, an organization creates remarkable and enduring solutions. These solutions catalyze continuously better and better customer experiences. If not, those customers will defect, over time, regardless of level of capital investment or equipment lifecycle. Three different perspectives, hmmm? That is an old-school, siloed approach to customer retention. In the industrial Internet of Things (IoT) ecosystem, new school mindset focuses on cross-functional collaboration. Regardless of the size of your organization. As a result, the view from the C-Suite focuses on leveraging partnerships at all levels of an organization, not just with the folks buying stuff. They consider possibilities which create innovative opportunities, such as collaborating with end-users on new product developments which result in business growth and expansion. Far more is involved in retaining customers than renewing them. Moving forward, are teams tasked with isolated tasks involved renewing customers? Or, are they focused on interrelated strategies for retaining them? Something to chew on this week.